If you’re the one to dye your locks, you know how difficult it is to preserve the color and prevent fading. Sometimes, it seems that no matter how hard you try, the color fades inevitably… Disappointing, right? Hello, ladies! It’s Monica, and I’ve prepared an extensive list of the very best shampoos and conditioners for color-treated hair, dyed blonde, red, and dark. They are meant to protect color, keeping your tresses beautiful, vibrant, and bright. Whether you’re looking for the best shampoo for African-American color-treated hair or the perfect moisturizing conditioner for brittle ends – there is probably a staple for you! 2.1 How to preserve the color for as long as possible? 2.2 Don’t you ever try to bleach your dark hair on your own! 2.3 How do I choose color if I want to dye my hair? 3 Best Shampoos For Color-Treated Hair: What Have We Learned About Them? In my top-list, there are products for any taste and budget, so you’re definitely spoiled for choice. So, what are we waiting for? Let’s get started! 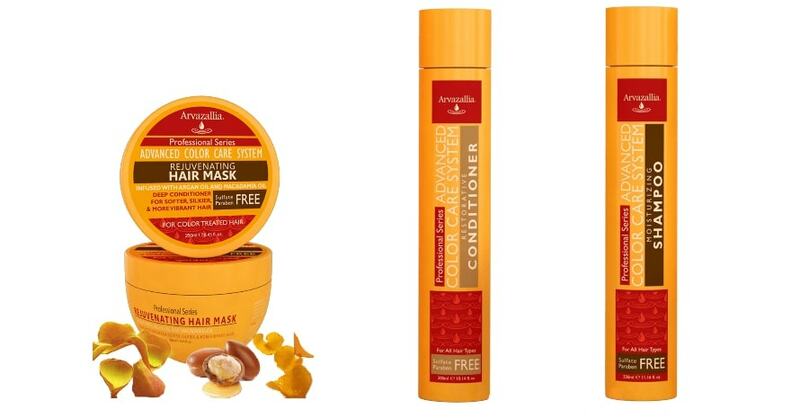 This set is meant to make your locks thicker and fuller, promoting hair growth. If you’re the one to suffer from thinning hair, that’s a real catch for you! For some of my clients, this duo was a great help during the chemo treatment as it helped to keep at least some hair. It’s made with organic ingredients such as aloe vera, coconut oil, cassava root, and more. Thanks to them, this shampoo and conditioner set provides your hair with vitamins, amino acids, and nutrients that it needs to grow and thrive. This duo not only nourishes and strengthens your precious tresses but also helps to restore moisture balance, treat split ends, and repair fibers. Hair feels soft and strong at the same time – what an amazing result! Also, these are the best shampoo and conditioner for African-American hair, both natural or processed. Besides argan oil, this set contains other natural ingredients like avocado, sea buckthorn, jojoba oils, and green tea. They help to restore and nourish dry, brittle or damaged locks. 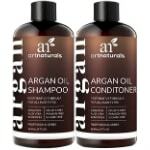 This shampoo and conditioner duo is mild enough to use not only on natural but also processed and color-treated hair. After using this set, hair feels softer, stronger, and more manageable. suitable for straight, wavy or curly hair. might cause itching and flaking. Both these products are made with natural botanicals like rosemary and juniper which give them this pleasant smell. These L’Oreal Paris shampoo and conditioner are said to be safe for color-treated hair, featuring the anti-fade system for the color to last longer. And this combo helps to protect color indeed. 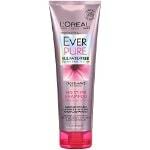 Also, the EverPure Moisture system restores essential moisture, making your hair softer, shinier, and easier to manage. 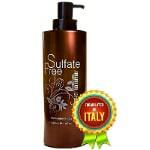 Finally, you can’t beat the price, especially as compared with other sulfate-free color-safe products. All in all, it’s the best drugstore shampoo for color-treated hair coupled with a great conditioner. In my experience, it’s the best shampoo for fine color-treated hair that gives amazing results if paired up with the conditioner. Containing argan oil and vitamin B5, these products are meant to make your hair strong, shiny, and full without weighing it down. They help to eliminate frizz, protect your precious locks, and soften them. After using this duo, hair feels soft and easy-to-manage, not to mention fullness and body. And if you’re the one to have curly hair, you curls will probably look more defined. 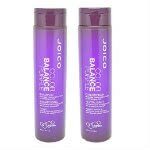 These shampoo and conditioner for color-treated hair are suitable for dry, damaged, thin, wavy, curly, and frizzy locks. What’s more, they come not only in travel-sized bottles but also as a trial and economy set, so you have many options here. set will cost you a pretty penny. Designed specifically for dyed locks, this Dove shampoo helps to keep color vibrant for up to 40 washes when used with the Dove Color Care conditioner. The shampoo is formulated with the Vibrant Color lock that helps to extend the life of hair color. According to the manufacturer, it’s suitable for daily use which is a big plus. 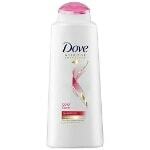 If used with the conditioner, this Dove shampoo for color-treated hair gently cleans and protects your tresses, leaving them silky, soft, and manageable. In a nutshell, it’s always better to follow it up with the conditioner. Red color-treated hair requires special treatment, and the John Frieda combo is meant to preserve and magnify your vibrant red color. I have to admit, this product seems a bit controversial. My clients with red-dyed hair said that it helped to preserve color indeed. And even some of those with naturally red tresses mentioned that this shampoo enhanced their natural color. However, there are some reviews where people complained about the product being useless. I guess, we’re all different so it’s hard to say for sure how this shampoo will affect your hair. also, may dry out your locks. This product contains plenty of natural ingredients like rosemary, spikenard & jojoba, argan, and tea tree oils. The number one is obviously sage that is known for its anti-inflammatory and antiseptic properties to combat dermatitis. After the very first wash, you will notice the difference. This Maple Holistics shampoo works wonders to reduce flaking and dandruff, leaving your hair soft and manageable. some people find it to be too drying. 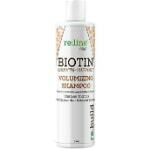 This clarifying shampoo is made to combat oiliness and dandruff. It contains a plethora of oils like jojoba, rosemary, lemon, basil, and cypress oils. All the ingredients work together to remove oily build-up, restore pH balance, and improve blood circulation in the scalp. Also, this shampoo can help with itching, prevent hair loss, and promote healthy hair growth. Whether your hair is color-treated or not, it’s a win-win! since it’s a clarifying shampoo, it may dry hair and scalp if used too often. I find this one to be the best Aveda shampoo for color-treated hair. It’s made with plenty of organic ingredients such as lavender, peppermint, ylang-ylang, and soy-derived vitamin E. The shampoo works pretty well, minimizing the color fade and adding body to hair. Still, there is a very little color fade after several washes, but I guess, that’s normal. I like how manageable and full my hair feels after using this shampoo, so I’m ready to sacrifice a little bit of color. The well-known argan oil, natural herbal extracts, protein, and vitamin E – all these ingredients work in perfect sync to moisturize, strengthen, and protect your precious locks. The organic formula of both products is infused with aloe vera, burdock root, rosemary, thyme, and more. This ArtNaturals shampoo gently cleanses hair without stripping the color, while the conditioner hydrates, protects, and adds extra shine. Used together, these products maximize their restorative and nourishing properties. no good for thinning locks. If you’re the one to suffer from hair loss or thinning hair, that is the product just for you. Not only it gives your locks extra volume but also helps with hair loss and promotes new hair growth. Besides the botanical biotin, the ingredients include caffeine that stimulates the scalp & argan oil and keratin that lock in moisture. After washing, hair feels thicker, fuller, and more voluminous – just make sure to rinse the product thoroughly. Plus, the color seems to be intact. This duo was created especially for dyed blonde hair to preserve the color and prevent it from getting brassy. The thing is, dyed silver/ashy/white/platinum blonde tends to get a bit brassy or yellowish almost inevitably. That is where this purple shampoo for color-treated hair comes into play. The manufacturer promises to preserve 89% of your hair color for up to 8 weeks which is quite impressive. This shampoo for blonde color-treated hair does a great job indeed. It removes brassiness, leaving almost no violet tint. However, if used too often, this shampoo may give your hair that purplish hue. I’d recommend to use it once in a while (as the directions suggest) and follow up with the conditioner to prevent dryness. both products are rather hard to clean out of the shower. As the manufacturer claims, the Colorlast formulas are inspired by the anti-fade properties of the vibrant orchid. So, these products were developed to protect your hair, balance moisture, and preserve the color which they do just great. The Colorlast shampoo gently cleans and maintains the color depth and tone, while the conditioner moisturizes, softens, and detangles. 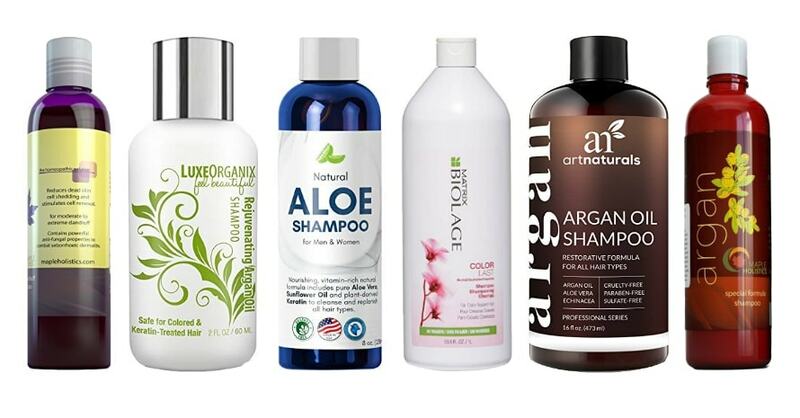 After using these products, hair feels soft, well-moisturized, and manageable. Even the damaged ends (which are quite a challenge for people with dry hair) seem to be receiving much-needed moisture. This hair care system is designed to hydrate, nourish, and repair damage caused by chemicals during perm or dye or excessive heat from styling. 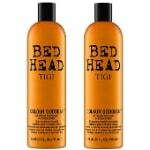 Both, shampoo and conditioner, are said to be suitable for all hair types, including curly color-treated hair. By the way, if you prefer to straighten your curls, they seem to be straightened easier with the help of these products. After washing, hair feels light, soft, less tangled and frizzy. Finally, anti-color fade formula helps to maintain the color, leaving your locks bright and shiny. hair gets oily a bit faster. As you’ve probably noticed, argan oil is quite a popular ingredient in many hair products. It’s no wonder, given its vast properties. Argan oil helps to promote healthy hair growth, increase hair elasticity, and restore shine to lifeless locks. These Moroccan Argan Oil shampoo and conditioner are the real catch for those who want to restore moisture balance, reduce flaking, and prevent dryness. Also, they help the color to stay longer. As a result, you will get soft, silky, and shiny locks that are full of life. one may not like the smell. The first thing you notice about this shampoo and conditioner is the scent. They smell like caramel or vanilla, and the scent is just awesome, yet some people may find it to be overpowering. As for the actual outcome, these products do the trick. The shampoo refreshes, cleanses, and removes build-up, when the conditioner smoothes and adds shine to your tresses. Hair becomes more resistant to breakage, thus you get fewer broken ends. There may be a little color fading after a few washes, but I guess that’s okay. Many of my clients admit that the color is holding up well with this duo. in some cases, there may be a little color fading. This Tea Tree shampoo is specially designed to combat scalp issues like dandruff, flaking, and itching. Containing tea tree, rosemary, and lavender oils, it purifies the scalp and restores the moisture balance to prevent dryness. The matching conditioner is made to deeply moisturize, smooth, and nourish your tresses with the help of argan oil, shea butter, sea buckthorn, and other ingredients. As a result, you will get soft, full, and less greasy hair & soothed scalp. free of sulfates, parabens, and silicone. no good for thinning hair since these products may cause shedding. 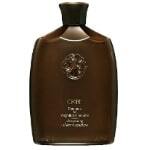 Coming in a luxurious claret-colored bottle, this ORIBE shampoo is designed especially for color-treated hair. It deeply cleanses, moisturizing damaged areas and extending the life of the color. The ORIBE Signature complex, containing watermelon, lychee, and edelweiss flower extracts, protects your hair from damaging, drying, and oxidative stress. I’d recommend to follow up this shampoo with the ORIBE conditioner for beautiful color. That way you will get soft, shiny, and less frizzy hair & the color that stays longer. One of my favorite treatments for dandruff, flaking, and itchiness. Thanks to tea tree oil, sage, arnica, and rosemary, this conditioner works wonders reducing flakes and soothing the scalp. You will probably notice the difference after the very first wash. Not only this product combats dandruff and itching but also leaves your hair soft and tangle-free. 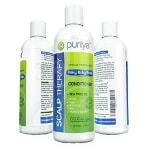 For better results, use it after the Puria Scalp Therapy Shampoo. The Scalp Therapy formula increases blood circulation in the scalp, moisturizes, and nourishes your precious locks. nice smell and thick consistency. 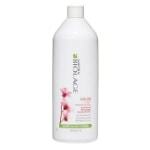 This gentle cleansing shampoo is formulated to prolong color retention and replenish much-needed moisture. It does a great job of hydrating and reviving dry locks indeed. It’s better to follow up this RUSK shampoo for color-treated hair with the Deepshine Color Hydrate conditioner for better results. But even without the help of the conditioner, the shampoo doesn’t seem to dry hair out. One may find the conditioner to be too heavy or strong, so you may want to alternate it with a weaker one to avoid weighing hair down. As the manufacturer claims, this shampoo is suitable for all hair types, including color-treated, damaged, and over-processed hair. The product protects the color, replenishes moisture, and helps to repair damaged locks. It contains Moroccan argan oil, aloe vera coconut oil, and hemp seed oil that work together to hydrate, provide UV protection, and fight frizz. Keratin and protein help to repair colored and thermally harmed strands. This shampoo leaves you with soft, smooth, and tangle-free hair without weighing it down. This sulfate-free restorative shampoo is made with a bunch of organic ingredients like botanical keratin, avocado oil, jojoba oil, almond oil, and camellia seed oil, not to mention organic Moroccan argan oil. Working in sync, they provide moisture for all hair types, including color-treated hair. This shampoo is a great help for those with oily hair, letting you go longer between washes. Also, it’s a pretty good shampoo for thin hair since it doesn’t weigh it down. For better results, use this shampoo coupled with the EOL Beauty Argan Oil Restorative conditioner. This shampoo features a very rich formula infused with vitamins and oils. Aloe Vera extract is well-known for its moisturizing and calming properties. It’s enhanced by sunflower oil that helps to repair dry and broken locks & prevent thinning hair, while plant-derived keratin promotes hair growth and adds volume. 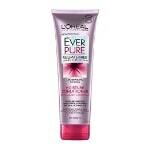 It’s a great shampoo for fine color-treated hair that makes it look fuller and denser. Also, it helps to tame frizzy tresses. Actually, this shampoo is suitable for all hair types, leaving you with super soft, smooth, and well-moisturized locks. That is a great duo for thick curly hair, especially African-American. The shampoo contains peach extract, ginseng, Irish moss, and wheat protein that moisturize and condition your locks without weighing them down. Vitamins B5 and E improve hair texture & coconut-derived cleansers provide rich lathering. 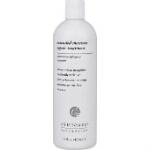 The conditioner detangles, strengthens, and helps to extend the lifespan of color. As a result, you get bouncy, shiny, soft, and healthy-looking tresses that are a pure joy to look at! This duo is safe for chemically, keratin, and color-treated hair. Argan oil protects your hair from styling heat and UV damage, while keratin and omega 3 fatty acids hydrate it deeply. Hair feels soft, smooth, and easy-to-style. These products are good even for thin hair since they don’t weigh it down. You’ve probably noticed that I’m a big fan of Maple Holistics. This duo contains a lot of beneficial ingredients like argan oil, jojoba oil, green tea, sea buckthorn, and more. 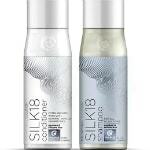 What’s more, the conditioner is formulated with a blend of 18 silk amino acids, thus the name. It’s great for curly frizzy locks but also boosts straight hair with volume. 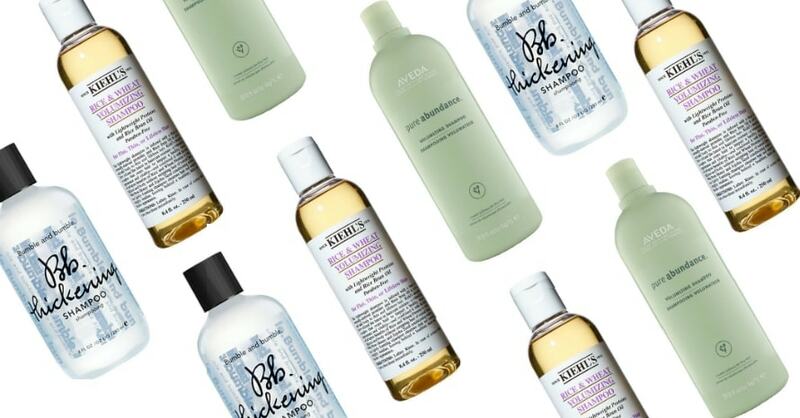 These products are meant to soften your hair, moisturize, and strengthen. Also, they help with itching and combat flaking. As a result, you get soft, silky, and shiny hair that is easy-to-manage. 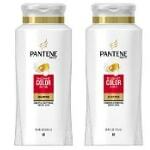 The moisturizing formula of this Pantene shampoo for color-treated hair is gentle enough for everyday use. Not only does this shampoo cleanses but also nourishes and makes detangling easier. The Chroma Spectrum technology helps to protect the color and reveal the shine of natural hair. After using this shampoo, hair looks bright, shiny, and healthy – and what more could one ask for? As for me, it is the best daily shampoo for color-treated hair. How to preserve the color for as long as possible? Try to avoid chlorinated water and sun rays. I don’t want to say that you shouldn’t go outside – you definitely should. Just cover your head with a hat or something like that. Also, reduce the usage of heat stylers such as blow-dryers, flat irons, and curling irons. Even the lowest temperatures can cause damage. The more frequently you wash your hair, the faster the color will fade. So spend some time and find the perfect shampoo for your color-treated locks which lets you wash them, like, every other day or less. And if you don’t like your current color and want to change it, you can use shampoos that contain sulfates – they strip color faster. Don’t you ever try to bleach your dark hair on your own! No good would come from this. Even if things seem okay at first, the color will probably change over time, and you will have to go to the salon. And that means extra procedures that inevitably damage hair. Bleaching is quite a challenge even for the professional, so the best thing you can do is to find a good stylist. Ask him how to start bleaching your hair, since it’s a complex process that usually goes through a number of stages. How do I choose color if I want to dye my hair? It’s believed that your natural color suits you the best as the mother nature gave it to you. However, since we have so many options these days, you can choose pretty much any color you want. Still, it’s better to start with the hair-dye that is one-two shades darker than your natural hair. That way you can try out hair coloring and, if necessary, go back to your natural hair with less damage and efforts. Best Shampoos For Color-Treated Hair: What Have We Learned About Them? There are so many shades and colors available – and there are shampoos just for every one of them. I highly recommend you to look through consumer reports on the best shampoos for color-treated hair before purchasing one. When the manufacturer tries hard to sell their product, real people can point its flaws. I hope my top-list will be helpful for you. I’ve tried to pick out different shampoos, for both blonde and dark hair, curly and straight one. Follow the tips I gave you to keep the color bright and vibrant. And feel free to ask more questions in the comment section below – I would be happy to answer them all! Ladies, what products do you use for dyed tresses? What is the best shampoo for color-treated hair and hard water/soft water? Many factors affect hair color, and the water is just one of them. So, how do you preserve the color in the first place? Let me know in the comments! Previous Previous post: The Best Shampoo For Men: Which One Suits Your Hair? Hi there! Monica and her friends are the best beauty bloggers ever, so I think they’ll help me out with some advice 🙂 My name is Mia, I have to dye my hair all the time because I’m a professional cosplayer. But the shampoo I use now can wash the color off sometimes. So which is the best shampoo to prevent color fading in your opinion? I and my girls are not exactly beauty bloggers, we prefer to call ourselves professional hairstylists. We don’t cover themes on makeup or skin care. But maybe someday we’ll do, who knows. Try Aveda Color Conserve Shampoo with Lavender and Peppermint. Oh, cosplay, that sounds like a lot of fun. Characters hairstyles can be crazy in cosplays, can’t they? Well, some hairstyles are really crazy, Monica 🙂 I already had to dye my hair blue, red, green, white… But the hardest thing I’ve ever faced with is wearing dreadlocks – caring about such a hairstyle is a real disaster… Thanks for your useful advice, I’ve already purchased that great natural shampoo you’ve recommended to me. The feeling after shampooing is amazing, my hair became silky and soft. And the smell of lavender and mint is so fresh, awesome combination, I really enjoyed it. Thank you, Monica! That Honeydew shampoo you’ve recommended here is amazing! It became a great hair care solution for our family. My son and husband began using it too and it works better than everything else I’ve bought them before, so I can say it’s the best natural shampoo for men as well. Talking about my dry hair, this organic natural shampoo made it silky and beautiful again. 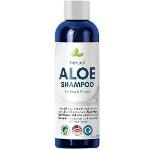 The formula of this awesome product has all the vitamins and other useful stuff for hair restoration. And the price is low, another thing that makes Honeydew the best family shampoo ever. I’m totally satisfied, strongly recommend to everyone. Hi, Monica! I’m 19 and this year is the first year to me when I’ve started dying my hair. I used a sulfate-free shampoo for natural hair before but now I think I need to change this product for something more appropriate. Can you tell what is the best shampoo for color treated hair? I’d recommend Maple Holistics Clarifying Shampoo for Color Treated Hair, you can read a review on it in this post. 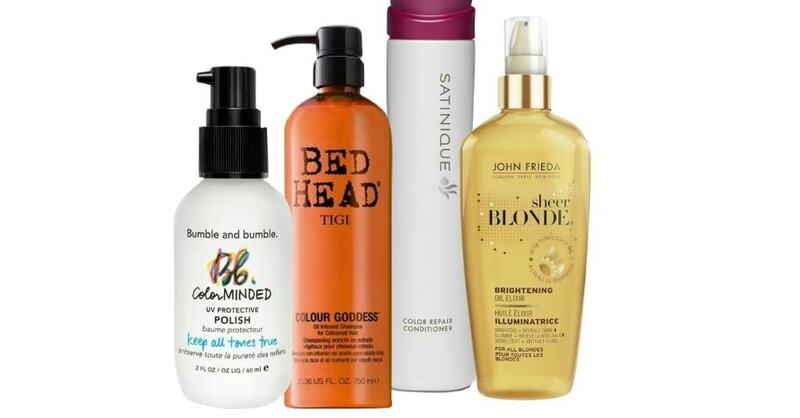 The list of best shampoos for colored hair you’ve described here is awesome, Monica! It’s a real treasure to those who like experiments with their hair color. I dye my hair every two months or so and choosing a good hair product is very important to me. I’ve already tried some stuff from your article. Maple Holistics Argan oil set is what I’ve chosen for everyday hair care – this is the best shampoo and conditioner for color treated hair I think. 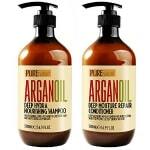 I’ve already tried some products with Argan oil and I was never disappointed with the result. This set is not an exception. My skin is very sensitive, and the effect of those products is gentle and delicate, so there is no discomfort to me. The formula is sunning: vitamins, minerals, everything you need for restoring softness and brightness of your hair. This amazing set worth buying it.